VIENNA, Austria -- Large numbers of personnel continue to flow into east Ukraine from Russia, according to the Chargé d'Affaires of the United States' mission to the Organization for Security and Co-operation in Europe (OSCE). Pro-Russian separatist fighters in east Ukraine, one of whom is wearing a traditional Cossack-style Kubanka hat. Large numbers of men wearing similar attire have recently crossed into Ukraine from Russia. According to the US representative to the OSCE they are unlikely to be in east Ukraine for the mushroom picking. In an address to the OSCE in Vienna on 17 March, the wording of which was obtained by IHS Jane's , Kate Byrnes noted that over 2,200 individuals in military-style uniforms had been seen crossing into east Ukraine in the first three months of the year. These figures relate to just two de facto separatist controlled border checkpoints (BCPs) at Hukovo and Donetsk, where the OSCE has a special observer mission (OM) active. Byrnes pointedly remarked that "these continued border crossings by young men wearing camouflage cannot be explained away by bizarre claims like they are just following fashion trends or going mushroom picking". Byrnes was making her remarks in response to a briefing by the leader of the OSCE OM in Ukraine, Swiss Lieutenant Colonel Simon Eugster. 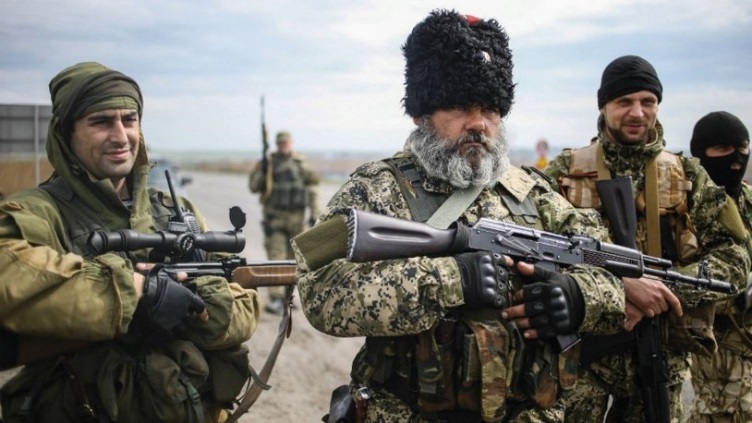 From the approval of the mission in July 2015 to the end of 2015, 4,758 individuals in military-style dress, many wearing traditional Cossack 'Kubanka' hats, were seen crossing into east Ukraine. Byrnes also criticised Russia for failing to respond meaningfully to technical proposals to enable the OM to operate more effectively. These include lifting restrictions on the movements of OSCE observers, or to enable them to use basic sighting equipment like binoculars. She also noted that Russia had also not created the 'security zone' along its border that was envisaged by the Minsk II protocol, nor has it allowed permanent monitoring of the border or other BCPs by the OSCE. The US Chargé d'Affaires further unveiled that the OM continues to register convoys of Russian vehicles crossing into Ukraine through those two BCPs. OSCE observers have only been able to see these convoys from a distance.